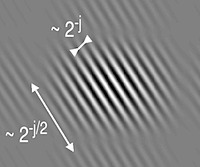 A wave atom, from the tight frame with redundancy 2 in the WaveAtom toolbox. Positive values in black, negative values in white. The WaveAtom toolbox in Matlab is released under the GNU Public License (GPL). This means that anyone can download, modify and distribute the code for free, under the terms of the license. It also means that the source of any code in which WaveAtom is embedded needs to be disclosed. For this reason, developers of proprietary codes should contact us for a no-strings attached license. and extract using tar zxvf WaveAtom-1.1.1.tar.gz in Unix. A directory WaveAtom will be created. Start with the README file. The toolbox can be reviewed and rated at the Matlab file exchange website.